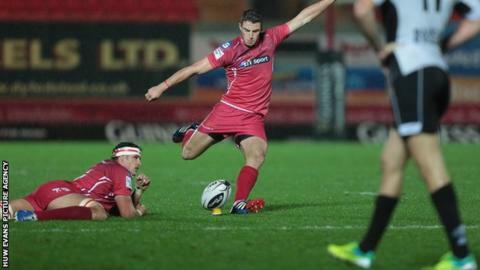 Scarlets came from behind to beat Italian side Zebre 28-13 in the Pro12 at Parc y Scarlets. The visitors, who are one off the bottom of the table, led 13-12 at half-time thanks to a Valerio Bernabo try and Edoardo Padovani's boot. After the break, the Welsh took control with replacement Steffan Hughes crossing midway through the half. Outside-half Steven Shingler, who kicked 23 of his side's 28 points, added the conversion. Shingler was one of the eight changes made by head coach Wayne Pivac to the side that beat Leicester in the European Champions Cup. The Welsh region had 18 players absent for Saturday's match because of international call-ups and injuries. Wet conditions contributed to an opening quarter littered with handling errors. A mistake led to the first try as Scarlets full-back Steffan Evans' kick was charged down by Valerio and the second row chased and gathered the ball to score. Padovanni converted to stretch Zebre's advantage to 13-9, but Shingler's fourth penalty brought the home side to within a point of the visitors. Pivac's side took control after half-time and Shingler kicked them into an 18-13 lead after 47 minutes. Zebre prop Dario Chistolini was yellow carded five minutes later after the Italians were penalised at the scrum. Scarlets lock George Earle followed him to the sin bin two minutes later for pulling down an attacking line-out. With both sides down to 14 men, replacement centre Hughes hit a great angle to score following a driving scrum. Shingler converted and sealed the points with his seventh penalty late on. Scarlets head coach Wayne Pivac told BBC Radio Wales: "It was pleasing because we had a patched-up side. "The conditions were tricky out there. There were a few errors in the first half that put them into the game. "Half-time was the key point. We controlled the game from there, kicked a few goals and got in front. "We came away with the win which is vital." Replacements: Elias for Myhill (71), John for Evans (71), Adriaanse for Edwards (71), Bennett for A Shingler (79), R Davies for A Davies (79), Lewis for S Shingler (79), Hughes for Phillips (2). Not used: Rory Pitman. Replacements: Fabiani for Manici (61), Lovotti for Aguero (61), Leibson for Chistolini (74), Vunisa for Van Schalkwyk (56), Bortolami for Bernabò (67), Violi for Leonard (69), Berryman for Toniolatti (54), Orquera for Padovani (69).